I made these for a potluck and they were gone before everything else was! Definitely a hit and I will be making again! Great Pot Luck Side Dish or a side dish for any meal !!!! Preheat oven to 400°F. 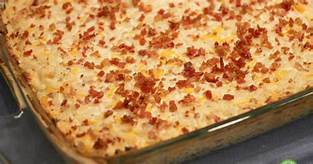 Grease a 9x13-inch baking dish and set aside. Mix the sour cream, Hidden Valley® Original Ranch® Salad Dressing & Seasoning Mix, crumbled bacon, scallions and cheese together in a large bowl until well combined. 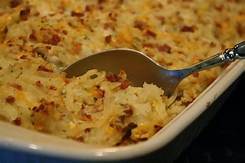 Add the shredded hash browns and stir until everything is evenly coated. Pour into the baking dish, and cook, uncovered, for 40–45 minutes, until crisp and golden.